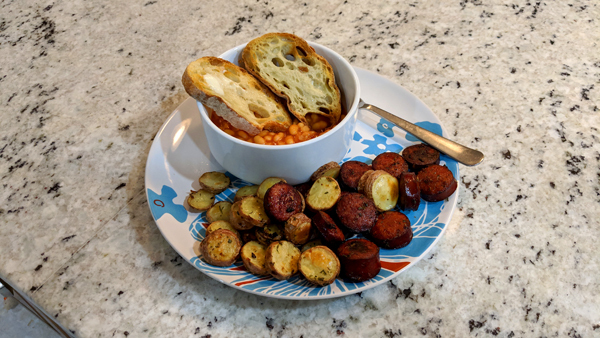 This is a super easy comfort dinner at Shaker Manor: Baked sausage and potatoes with a side of British baked beans and crusty bread. 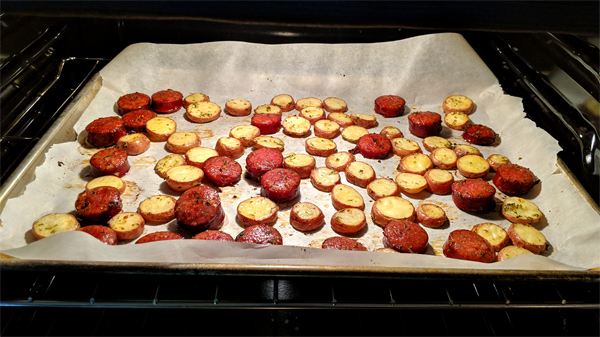 Here's a good recipe for making the sausage and potatoes (I used smoked sausage instead of kielbasa) — which, by the way, fills the house with the most amazing smell while it's cooking. The beans are just a tin of Heinz Beans in Tomato Sauce heated up on the stovetop, and I toast and butter a few slices of ciabatta bread or baguette or whatever we've got in the house for an "elevated" beans on toast. Easy peasy and very tasty.